Malvern, a residential suburb 8 km south-east of Melbourne, lies between Gardiners Creek on its north and Dandenong Road on its south. It extends eastwards from Glenferrie Road, Toorak, to Tooronga Road. It was also a municipality until 1994. The first European settler in the district was John Gardiner, pastoral overlander from Yass, New South Wales, in 1835. His homestead was probably in the vicinity of the Kooyong railway station, near the Kooyong Koot or Gardiners Creek. One authority places the homestead at the corner of Elizabeth Street and Toorak Road (Malvern) whilst there is a memorial outside Scotch College, Glenferrie Road (Hawthorn) north of the creek. 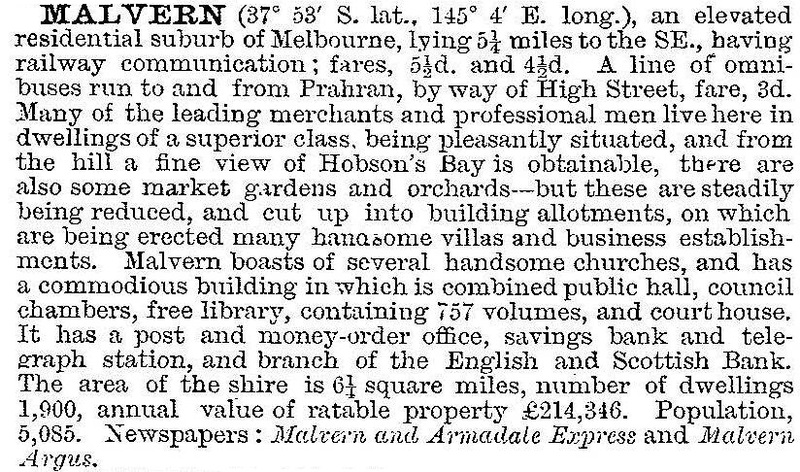 Gardiner's name was given to Gardiners Creek Road (now Toorak Road), the creek, to a locality and railway station to the east, and to the original shire which was renamed Malvern in 1878. The first Government land sales were held in 1854, within the triangular area bounded by Kooyong Road, Gardiners Creek and Wattletree Road. A hamlet formed in the vicinity of Malvern and Glenferrie Roads, where a hotel was opened. Another hotel opened in 1855 in Wattletree Road to catch traffic between Melbourne and Gippsland. It is now a residence, and is on the Victorian Heritage Register. In 1856 the Gardiners Road District was formed, extending southwards to Dandenong Road. In 1854 the Anglican church began services and opened a primary school. The bluestone St Georges Church of England (near the future town hall) was opened in 1869, and the school continued until replaced in 1875 by the State school in Spring Road (east of the town hall) in 1875. The name Malvern arose from the Malvern Hill Estate, a number of private lots sold by Charles Skinner, barrister, in 1856. Skinner's forebears lived at Ledbury, near Malvern Hill, Herefordshire. 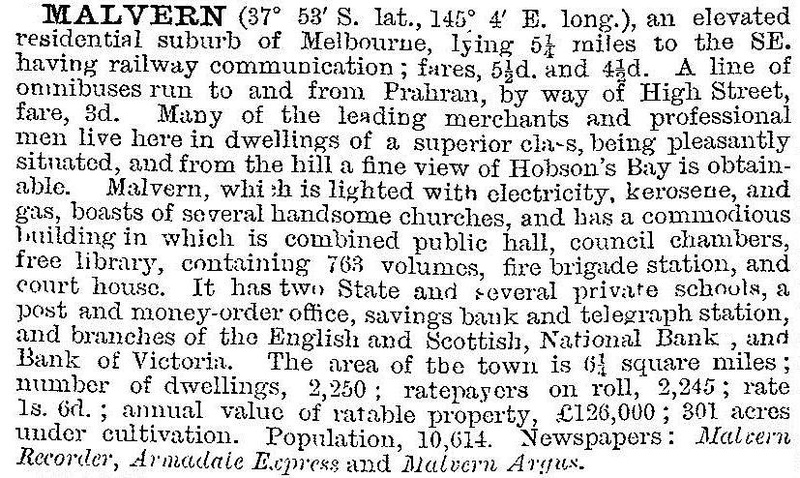 His sale included a village named Ledbury at the north-west corner of Malvern and Glenferrie Roads, where he built the Malvern Hill Hotel. The hotel name overtook the village name as the title for the area. Malvern gained some notable residences. Foremost was Stonnington, Glenferrie Road (1890). It was the State Government House, 1901-32, and has become a campus of Deakin University. Not far behind was Valentines, built in 1891-92 for John Davies, unsuccessful speculator. It became Malvern Grammar School (1923) and later Caulfield Grammar's junior campus. It is near Sacre Coeur girls' school (1888) accommodated in Brynmawr (1859), and Korowa Anglican girls' secondary school (1890). These three schools are in the part of the former Malvern municipality known as Glen Iris. Gardiner Road District became Gardiner Shire in 1871 and Malvern Shire in 1876. Its area was 6 sq miles. Malvern has public gardens and an oval near the town hall and public gardens in Spring Road. Other public reserves are further afield, mostly along the Gardiners Creek valley. Malvern’s heritage-listed buildings include: Town hall (1886), Stonnington (1890), Presbyterian church, Wattletree Road (1906), Railway station (1912) and Former ES and A bank, opposite Town hall (1959). At the 2011 census, Malvern residents’ median incomes were 64% above the Victorian median. 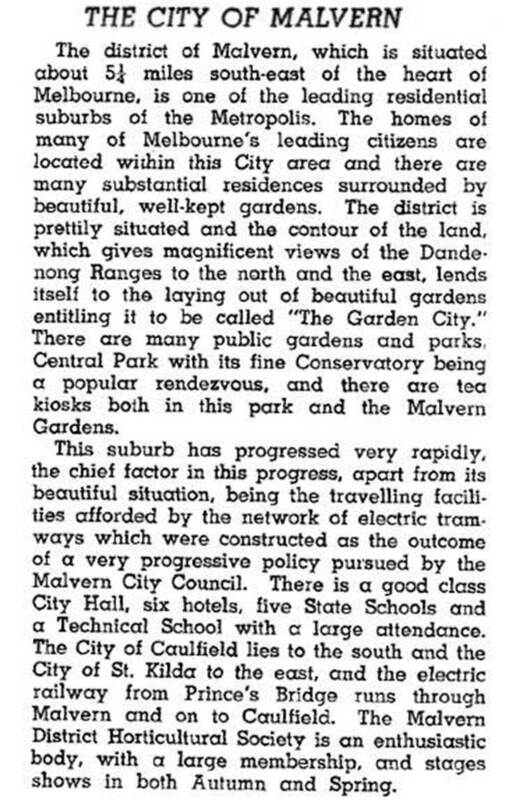 The Malvern municipality contained the eastern part of Toorak, the western part of Glen Iris and part of Chadstone. All of its suburbs and localities are listed below under further reading. On 22 June 1994, Malvern city and most of Prahran city were united to form Stonnington city.